Part 12 of the “Occupational Hazards” Story Arc. Sorry about yesterday; if you haven’t noticed, my sites were down since it seems the WordPress database crashed. Anyway, here’s a new comic, and probably a pivotal point in the storyline. We’re gaining momentum here, people! Now, if there’s one thing I’ve noticed in coffee shop employees (at least back in my old schoolin’ grounds, the University of Illinois), it’s that a whole lot of them have nose-rings, love indie music, and are of the fine arts or literature major persuasion. It’s almost a proven stereotype, especially if you go to one of those small-chain or independent coffee shops. 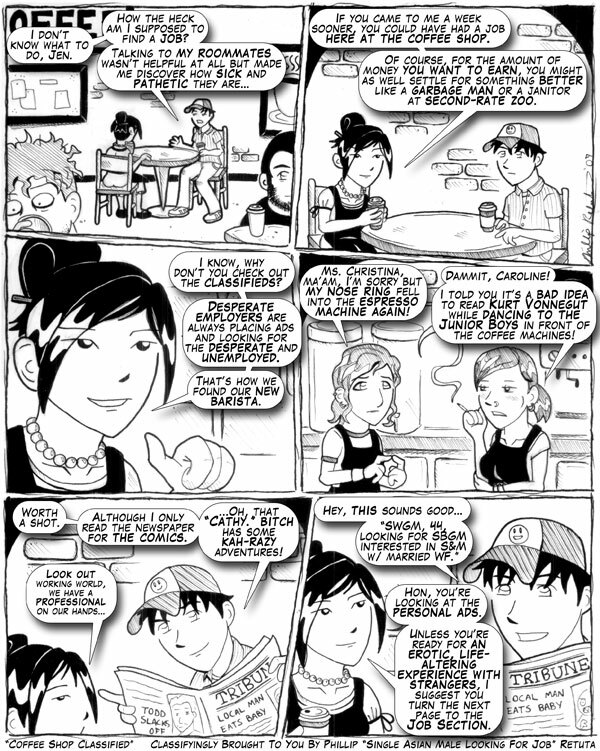 And I know my friends Christina (a coffee shop manager in real life) and Caroline had previously asked to appear in the comic; well, here you go. And remember, there’s a contest going on for free books. No harm in trying. Nice Todd ref. Is Jen fading into oblivion in the 5th panel? She aint got no face. Who checks the newspaper before craigslist anyway? Casual Encounters FTW. Tim, the comic takes place before Craigsist’s existence, 1987. Junior Boys formed in 1999 in Hamilton, Ontario, Canada. Did the CD fall through a time warp wormhole from the future? Junior Boys can travel through time. They’re the Junior Boys.